More than double the storage capacity of stationary filing systems. Filing shelves move with ease along ball-bearing tracks with four wheels per carriage. Easy expansion - system grows along with your storage requirements. Photo shows model with 7 tiers. Contact us to speak with one of our friendly expert customer service representatives for assistance with the many available customization options. Datum Vu-Stak® BiSlider™ open shelf medical filing units are designed to use a minimal amount of office floor space while vastly increasing storage capacity and providing your medical office staff with easy accessibility to vital records. Datum Vu-Stak® BiSlider™ filing systems increase storage capacity by converting stationary files to moveable systems requiring only a fraction of the floor space. By eliminating fixed aisles between shelves, more units fit in the same space. Just a light push moves the 36" wide Vu-Stak® shelving units along the two-track BiSlider™, featuring ball-bearing construction, four wheels per carriage and specially-designed rubber end stops for quiet, smooth, and easy operation. Installation is easy because all Datum shelving is TrakSlider™-ready, with pre-punched tops for hassle-free set-up. The modular design of Datum's TrakSlider™ systems allows for easy expansion as your storage requirements increase. All Datum TrakSlider™ systems can be reconfigured and added onto at any time without the need to disassemble, relocate, or remove existing files. All Datum TrakSlider™ track units consist of modular, all-welded steel frame and rail assemblies, flush decking, lateral rolling carriages, and overhead stabilizer and roller assemblies. All TrakSlider™ carriages include four wheels that ride on a double rail track for an added measure of stability and safety. The TrakSlider™'s heavy-duty welded steel construction includes an overhead anti-tip mechanism to ensure safe and easy movement of files. A reinforced steel leveling track means you can use the TrakSlider™ system safely, even on non-level floors! 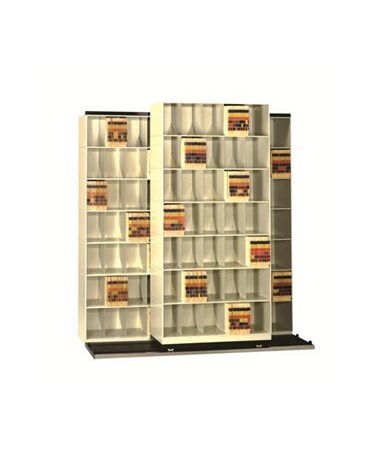 Vu-Stak® slant-tier letter-size shelving provides the ultimate in space-efficient medical file storage. Designed for use with color-coded side-tab medical filing folders, each 36" wide unit is made from durable powder-coated steel for a lifetime of use. Each tier contains three fixed dividers, and is slanted at a 55-degree angle for better file visibility and increased retrieval efficiency. Select your preferred filing system based on your needs. Vu-Stak® Systems are available in three configurations at your choice. Shelving units are available in two professional paint colors. Track assemblies are available in black paint only. Contact one of our friendly, knowledgeable customer service representatives about additional colors, customization options, and for assistance with creating your own unique, space-efficient moveable open shelf filing solution! 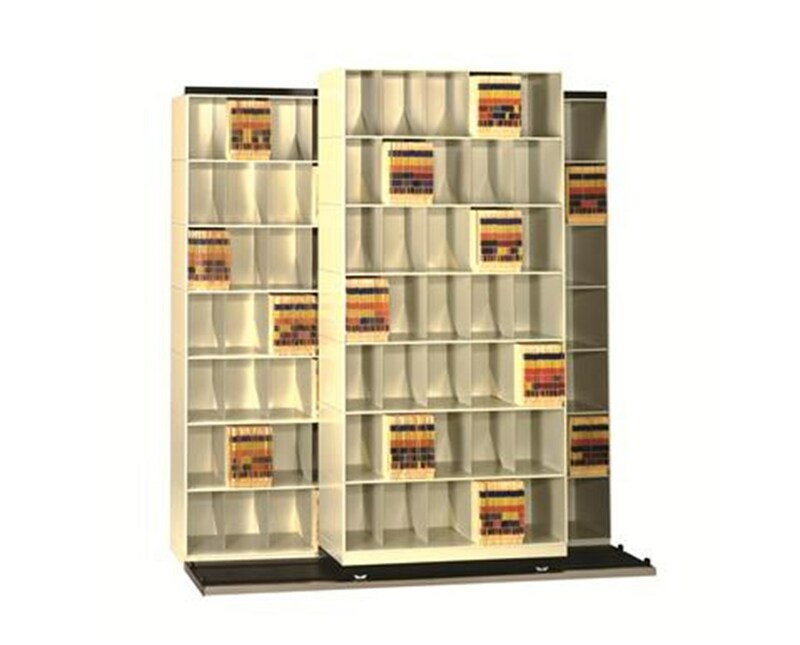 To order now, please see the dropdown menu above and click "Add to Cart"
Three 36" wide, VuStak® letter-size open shelf filing units, including top and base sets. Choice of 6, 7 or 8 tiers. 55-degree slanted shelving tiers, with 3 welded fixed dividers. One-piece welded steel carriage in track assembly. Ball-bearing track construction with four wheels per carriage for smooth quiet operation. Specially-designed rubber end stops provide cushioning at track termination points. Anti-tip safety mechanism ensures safe and easy movement of files along track. Reinforced steel leveling track allows smooth operation even on non-level floors. All Datum products are covered by a Limited Lifetime Warranty. Individual Shelving Unit Width 36"
Individual Shelving Unit Depth 10"
Overall Height 69-3/4", 80-1/8", 90-1/2"
Conversion plate for track assembly. Three 36" wide top and base sets for slanted-tier, letter-size filing units.